Austria: class 2143 ČD class 742 (TBC), 09:25/13:25/16:25 Retz to Drosendorf and 11:55/14:55/17:55 return. “Reblaus-Express”. Operated by NÖVOG. Link. Czech Republic: class 749, “Podtrosecký rychlík”: 08:09 Praha Vrsovice to Jicin and 16:54 return. Operated by KZC. Link. Czech Republic: class 749, “Kokořínský rychlík”: 08:30 Praha Vrsovice to Mseno and 17:00 return. Operated by KZC. Link. Czech Republic: class 749, “Cyklo Brdy”: 08:46 Praha hl n to Březnice and 17:23 return. Link. Czech Republic: class 749, “Posázavský pacifik”: 09:25 Praha hl n to Čerčany and 15:37 return. Link. Germany: 109 073 (or WFL class 155 if not available), EN301 17p00 Malmö Central to Berlin Hbf – from Sassnitz. Berlin Night Express. Germany: 109 073 (or WFL class 155 if not available), EN300 18:55 Berlin Hbf to Malmö Central – to Sassnitz. Berlin Night Express. Germany: V36 123 (ex-DB 236 123) or Köf 6204 (ex-DB 322 044), 10:00/14:00/16:00 Ebermannstadt to Behringersmühle and 11:00/15:00/17:00 return. Operated by Dampfbahn Fränkische Schweiz. Link. Germany: V36 412 (ex-DB 236 412) and VT03 (DMU), 09:30/11:30/15:30/17:30 Lengerich Stadt to Bad Iburg and 11:10/15:10/17:10/19:10 return. Details TBC. Operated by Eisenbahn Tradition Lengerich. Link. Germany: V65 001 (ex-DB 265 001), hourly shuttles between Osnabrück Hbf and Zechenbahnhof Piesberg. Operated by Osnabrücker Dampflokfreunde. Link. Switzerland: RhB Ge6/6 I, 08:55 Landquart to St Moritz and 14:15 return, “Erlebniszug Albula” operated by the Rhätische Bahn, 10 CHF. Link. France: Class BB63500 (BB63816 or BB63924), 11:00 / 14:30 / 16:00 Martel to St-Denis Les Martel and return. Operated by Chemin de fer Touristique du Haut Quercy. Link. Germany: 112 565 (ex-DB 202 565) top and tail with 114 703 (ex-DB 202 703), service trains as an hourly shuttle vice DMU between Pockau-Lengefeld and Olbernhau. Germany: 204 271 (ex-DB 202 271) top and tail with 86 1333 (steam), 09:40/10:40/11:40/14:40/15:40/16:40 Bergen auf Rügen to Lauterbach Mole and 10:00/11:04/12:00/15:04/16:00/17:04 return. Service trains vice DMU in connection with the “LebensArt” festival. Link. Czech Republic: T478 1001 (ex-ČD 751 001), T478 3001 (ex-ČD 753 001), 433 001 (steam) and 475 179 (steam), special trains in association with an event at Pernštejn Castle: Brno – Nedvědice / Havlíčkův Brod – Nedvědice and return. Operated by ČD Nostalgie. Link. Germany: V36 204 (ex-DB 236 204) (assumed), 10:10/14:10 Blomberg-Zollhaus to Weizen and 12:41/16:41 return. Operated by Sauschwänzlebahn. Link. Austria: ÖBB Class 1099, 09:07 St Pölten to Mariazell and 15:27 return. Operated by NÖVOG. Link. Belgium: 9105, “Scheldeland in Stoom” event at Stoomtrein Dendermonde-Puurs. Link. Czech Republic: T444 1062 (ex-ČD 726 062) and 423 041 (steam), Praha-Braník – Čerčany – Sázava – Ledečko and return. Operated by ČD Nostalgie. Link. France: CC6558, Chambery to Avignon for CC6558 and CC6570 forward to Cerbere. Operated by APMFS and APCC6570. Link. France: Class BB63500 (BB63816 or BB63924), 14:30 Martel to St-Denis Les Martel and return. Operated by Chemin de fer Touristique du Haut Quercy. Link. Germany: 143 559, Cottbus – Frankfurt (Oder) – Berlin Hohenschönhausen – Ostseebad Binz and return. Operated by Lausitzer Dampflokclub. Link. Austria: Unspecified narrow gauge diesel loco, 10:45/13:45/15:45 Bezau to Schwarzenberg and 11:25/14:25/16:25 return. Operated by Waelderbaehnle. Link. France: CC6570, Avignon to Sete and return. Operated by APCC6570. Link. Germany: E94 088 (ex-ÖBB 1020 010), 08:30 Heilbronn Hbf to Völklingen and 16:00 return. Operated by Süddeutsches Eisenbahnmuseum Heilbronn. Link. Cancelled. Northern Ireland: unspecified diesel loco, services at Downpatrick & County Down Railway vice steam due to fire risk. Link. Switzerland: unspecified electric loco (potentially Re6/6), Luino(?) to Schaffhausen. More details TBC. Operated by Verbano Express. Link. Postponed to 15/07/18. Switzerland: BLS Ae4/4 251, 07:46 Burgdorf to Brig and 14:58 return. “Erlebniszug Lötschberg”. Operated by BLS. Link. Austria: StLB VL12 (assumed), 09:00/16:00 Birkfeld to Weiz and 12:00/17:50 return. Operated by Feistritztalbahn. Link. Germany: 112 708 (ex-DB 202 708) top and tail with 86 1333 (steam), 14:00/15:30/17:00/18:45/20:45 Ladebow to Greifswald Hbf and 14:45/16:15/17:50/19:30/21:30 return. Service trains vice DMU in connection with the “LebensArt” festival. Link. 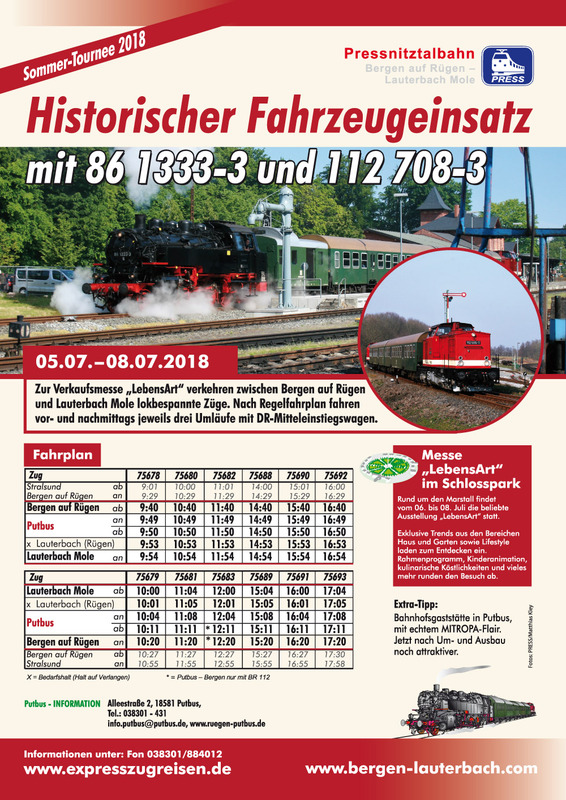 Note – 112 708 is listed in the publicity as being the V100 in question, but 204 271 has replaced it between 05-08/07/18 on Rügen so may do so again here. Austria: class 2143, 09:14 Wien Praterstern to Ernstbrunn and 16:45 return. Operated by Regiobahn – “Nostalgieexpress Leiser Berge”. Link. Germany: class E11 (211 030? ), Gerstungen to Bergen auf Rügen and return. Operated by Rennsteigbahn. Link. Germany: 112 708 (ex-DB 202 708) top and tail with 86 1333 (steam), 08:45/10:15/11:45/14:00/15:30/17:00/18:45/20:45 Ladebow to Greifswald Hbf and 09:30/11:00/12:30/14:45/16:15/17:50/19:30/21:30 return. Service trains vice DMU in connection with the “LebensArt” festival. Link. 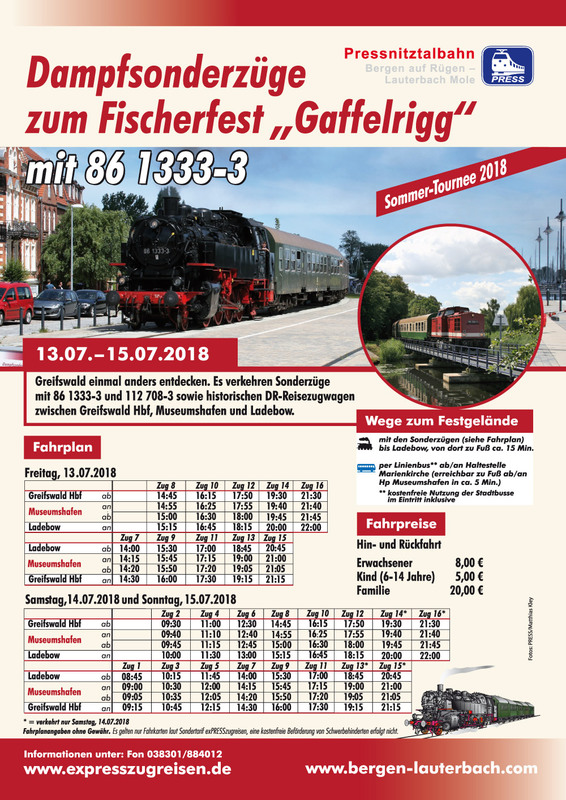 Note – 112 708 is listed in the publicity as being the V100 in question, but 204 271 has replaced it between 05-08/07/18 on Rügen so may do so again here. Germany: class 218, 07:35 Lübeck Hbf to Westerland and 19:55 return. Operated by Historische Eisenbahnfahrzeuge Lübeck. Link. Germany: V60 615 (ex-DB 360 615), 09:00 Hamm (Westf) Hbf to Ruhrgebiet area and return. Operated by Museumseisenbahn Hamm. Link. Germany: unspecified diesel locomotive(s), footplate rides at the Sommerfest at the Eisenbahnmuseum Leipzig. Details TBC. Luxembourg: TBC – “Blues Express” at AMTF Train 1900. This event usually involves CFL 856. More details awaited. Denmark: HHJ DL11 (Frichs 2 x 250hp loco), 11:10/14:10 Vejle to Jelling and 12:17/15:17 return. Operated by Sydjyllands Veterantog. Link. Germany: V65 001 (ex-DB 265 001), 14:00 Zechenbahnhof Piesberg to Melle and 18:10 return. Operated by Osnabrücker Dampflokfreunde. Link. Germany: ex-DR V60, Cottbus – Calau – Senftenberg – Schwarzkollm and return. Operated by Lausitzer Dampflokclub. Link. France: A1AA1A 68540, Les Aubrais to Paris Austerlitz and return. Operated by AAATV. Link. Germany: class E11 (211 030? ), Saalfeld to Bergen auf Rügen and return. Operated by Rennsteigbahn. Link. Belgium: TBC, special event at the Chemin de fer à vapeur des 3 vallées. More details awaited. Italy: historic diesel locomotive, Torino to Nucetto and return. Operated by VIC Tour Operator. Link. Germany: class 110, Wuppertal to Boppard and return (figure of eight – out via Bonn-Beuel, back via Rüdesheim and Bonn Hbf). Operated by AKE Rheingold. Link. Germany: DB class 103 (103 113 expected), provisional railtour from Treysa to Passau and return. Operated by Eisenbahnfreunde Treysa. Link. Germany: unspecified diesel (2 x DB V100 assumed?) Ilmenau to Erfurt for class E11 (211 030?) to Bergen auf Rügen and return. Operated by Rennsteigbahn. Link. Germany: V160 002 (ex-DB 216 002) top and tail with 78 468 (steam), Buchholz to Westerland and return. Operated by Nostalgiezugreisen. Link.